This property is directly associated with a crucial period (1950-1966) during which downtown commercial redevelopment began to occur after nearly thirty years of stagnation as several major modern municipal government and commercial buildings were constructed. However, compared with massive post-war suburban real estate development, relatively few new buildings were constructed in downtown Seattle until the late 1950s. Major modern construction included the Public Safety Building (1951, destroyed), Seattle Public Library (1956-59, destroyed) and the Municipal Building (1959-61, destroyed), as well as the expansions of the two major downtown department stores. Scattered major commercial construction included several notable extant buildings that reflect modern zoning changes and architectural trends including: the Norton Building (1958); the Logan Building (1959); the Washington Building (1960) and the IBM Building (1961-64). The Seattle World’s Fair - Century 21 Exposition was held in 1962 and triggered the remodeling of older buildings and the construction of the monorail, and tourist-oriented restaurants and motels. Throughout this era older buildings were demolished to make way for surface parking lots and garages and for interstate freeway construction. The Norton Building, completed in 1959, was one of Seattle’s first advanced aluminum and glass curtain-walled office building and the first major high-rise structure to be constructed in the city since 1930. It is Seattle’s finest example of the International Style, which combined building technology and modern construction materials to express ideal building forms. At the time of its construction, it was considered to be highly innovative in its use of technology, composite structural system and its curtain-wall design, which was assembled from pre-glazed wall units. Reportedly, it was the first building constructed in the United States over six stories in height to incorporate pre-stressed concrete structural members. The building was designed by Myron Goldsmith of the San Francisco office of Skidmore, Owings, and Merrill (SOM), the nation’s preeminent practitioners of high-rise design during this era. Goldsmith is best known as one of Ludwig Mies van der Rohe's most distinguished students, and the design of the building - its rectilinear form set on a horizontal plaza atop a plinth - reflects the direct influence of Miesian esthetics. The Norton Building follows in style and precedent New York City’s dramatic Lever Building, one of SOM’s better known and ground breaking works. Constructed in 1952, the Lever House along with its contemporary, the United Nations Secretariat Building, was the first curtain wall designed building in New York City and is widely considered an icon of modernism and the International Style. Seattle architects Bindon & Wright served as local associate architects on the project. Leonard William Bindon, born in London and graduate of University of Washington School of Architecture in 1924, worked as an architect in a variety of firms before forming a partnership with John Paul Jones in 1948. After Jones’ retirement, Bindon formed a partnership with John LeBaron Wright in 1956. Wright, a native of Bismarck, North Dakota and a graduate of the University of Illinois, arrived in Seattle in 1947 and was employed by Jones and Bindon before taking over that partnership to establish Bindon & Wright. Together, Bindon and Wright designed other notable buildings such as the Downtown Seattle Public Library (1956-59, destroyed), the Bethlehem Pacific Coast Steel Corporation Office Building, Seattle (1960), Fire Station #32 and #40 as well as numerous schools for the Seattle, Bellevue, and Ferndale districts; however, the Norton Building remains their most notable work. The nineteen-story Norton Building was initially planned as an addition to the neighboring Exchange Building, but grew into an independent construction project. It was constructed for the Northwest Building Corporation at a cost of $12 million. The building was rapidly constructed by the Howard S. Wright Construction Co., completed in October 1959 and formally opened in a dedication ceremony on October 30, 1959. The building was named in honor of Matthew G. Norton, a pioneer lumberman who had great faith in the future of Seattle and the grandfather of Norton Clapp, chairman of the Northwest Building Corporation. Norton Clapp was also very well known for having been one of the five original investors in the Space Needle. At its dedication, the theme of the Norton Building was described as “the aura of progress and aim for the future” and the event was celebrated with speeches as well as a science and space exhibition entitled “Prevue 21” that featured models of the Century 21 World’s Fair. The rigid curtain wall design of the building allowed for the building to be constructed without interior columns, and with movable partitions and ducting systems between floors; thus, tenants had the ability to arrange their offices to suit their specific special needs and requirements. This also included flexible movement of phone outlets and separately controlled heating and cooling systems for floor level and office space. At the time of construction the building also included among its modern amenities the longest escalator west of New York City running between First and Second Avenue entrance lobbies. The building was also the first Seattle highrise to include internal parking facilities within the building construction. The Norton Building was also the city’s first highrise office tower to include a major off-street pedestrian plaza. The original design of the Norton Building also incorporated public art. The building owners commissioned two artists from Washington State to create major pieces to illustrate the Norton Buildings themes of progress and the future. One sculpture, created by Harold Balaza, symbolized machine and manmade forms in order to convey the region’s burgeoning economy. It was originally placed in the pedestrian plaza. A second public art piece was a bronze statue created by Philip McCracken entitled “Restless Bird,” symbolizing the restless awakening Pacific Northwest with all its natural and other resources. This piece was to be displayed within the building lobby. The “Restless Bird” statue remains in public view today, but is now displayed in the pedestrian plaza. The inclusion of modern public art and sculpture of this type in the building design was considered a modern innovation and promoted as a unique feature in Seattle at the time. A major $3.5 million renovation was undertaken in 1983, the first major renovation of a modern era building in downtown Seattle. The project was undertaken by Robert E. Bayley Construction Co. and designed by architects Loschky, Marquart & Nesholm. The work was designed to enhance, rather than detract from, the original building design. The work included improvements to the Second Avenue pedestrian plaza. A red granite non-skid walking surface was installed as well as landscape plantings and comfortable outdoor seating. New building identification pylons surfaced with polished granite were added on both sides of the plaza. Also, the Philip McCracken bird sculpture was refurbished and reset in the building entry. Inside the building, the main Second Avenue lobby was enlarged toward First Avenue to double its original size and a polished stainless steel and glass revolving door system was installed. The new lobby was designed to provide additional interior seating areas and improve the ease of pedestrian traffic flow in and out of the building. The First Avenue lobby was also upgraded and the garage was renovated. An integral part of the renovations were improvements to the mechanical and electrical improvements, which brought the building up to modern fire and life safety standards. This Norton Building is a well- preserved and highly regarded example of an important mid-century highrise property type. It is a particularly significant example of International Style architectural design. It was designed by a notable local architecture firm, Bindon and Wright, in collaboration with the San Francisco office of Skidmore, Owings, and Merrill (SOM), a highly notable and nationally recognized innovator in the design of modern highrise buildings of the era. This particularly prominent 17-story office building is located on a sloping site along the entire southern half of the city block between Second Avenue and First Avenue at Columbia Street. It is considered to be Seattle’s best example of the International Style and reflects the direct design influences of Mies van der Rohe. The office tower measure approximately 72’ x 215’ and rises above a three-story base that measures approximately 119’ x 235 feet. The formal entry to the building is via a pedestrian plaza and entrance lobby at Second Avenue. The tower abuts Columbia Street and First Avenue and is set back from the sidewalk edge at Second Avenue with a two-story entry lobby wing further recessed to the north side of the office tower. The crisp rectangular form of the office tower rises elegantly on slender lobby level granite clad columns above the monumental base. Due to the sloping site three levels of parking and mechanical equipment were designed to be housed within the building base. Garage access/egress driveways and a pedestrian lobby (with escalator access to the main upper floor lobby) are located at First Avenue. Building service/delivery bay openings are located at Columbia Street. The base is entirely clad with polished black/pink/white color granite that is only penetrated by service openings and air intake openings (tall narrow vertical slots some 20 feet above street level at First Avenue) and is monumental in character. The elevator and service core runs from the center of the base and up the tower at the center of the north wall. Each floor level of the tower from the 2nd through the 17th floor includes open and flexible office space that is essentially column free on all three sides of the elevator core. Two elevator and cooling tower penthouses that measure approximately 71’ x 36’ are located above the 17th floor level. The composite structural steel and concrete construction includes innovative pre-stressed concrete and long span modular concrete members. The tower is unique due to its innovative curtainwall construction utilizing some 1,792 pre-glazed spandrel and window panel units. The typical curtainwall panels are (1) opaque tempered glass backed by an insulated metal pan within aluminum frames and (2) window panels of grey heat-absorbing glass within anodized aluminum frames. All of the panels were fabricated off-site by Fentron Industries. The off street pedestrian plaza level of the tower and the entrance lobby wing includes extensive glazed wall areas and structural members are clad with a polished red /pink/black granite veneer. An original concrete sculpture “Restless Bird” by Philip McCracken is also located in the plaza/lobby area. A reflecting pool was originally located to the west side of the glass enclosed entry wing. 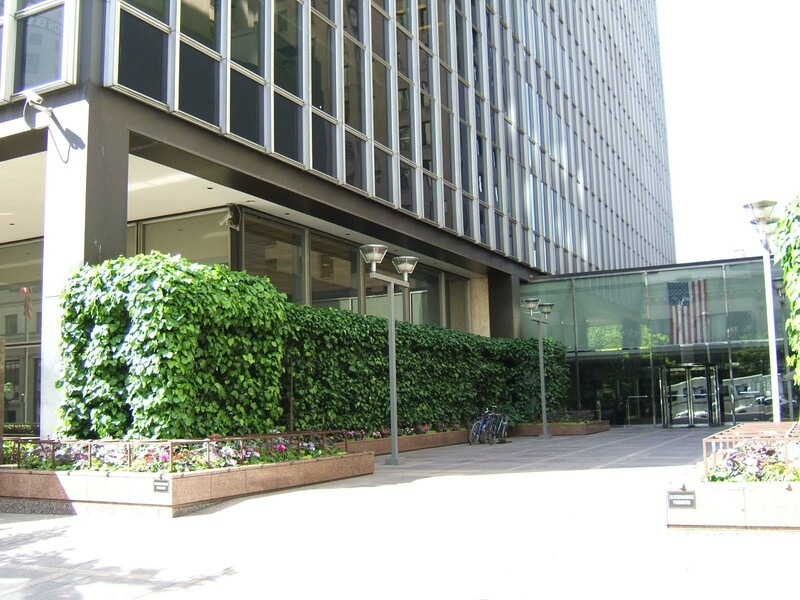 At the east face of SE corner of base on Second Avenue is an inscribed granite plaque that states “Norton Clapp 1959.” The entrance plaza and first floor lobby at Second Avenue were slightly altered in 1983 with the addition of landscaping features and interior alterations intended to reduce the transparency and openness of the original plaza area and adjacent banking lobby. Alterations included the installation of a non-skid granite paving and flooring within the pedestrian plaza and lobby, construction of two steel trellises with granite benches/planter boxes at each side of the plaza, and the installation of new matching polished granite cladding at the north wall of the plaza area that extends along and into the north wall of the lobby. The west wall of the lobby wing was also moved westward to enlarge the lobby and create additional tenant space and the reflecting pool was eliminated. Modern stainless steel/glass revolving doors were installed. Two new granite and stainless steel building identification pylons were placed near the Second Avenue pedestrian entryway. Original interior finishes within the lobby include polished Alaskan white marble cladding at the south wall and the elevator vestibule. An original wall clock and elevator operation panel remains in use. There are likely to be other intact or architecturally significant interior features and finishes at upper floor levels; additional in-depth field investigation is warranted. City of Seattle. Seattle Inventory Field Form. 1979. Steinbrueck, Victor. Seattle Skyline, University of Washington Press, 1962.